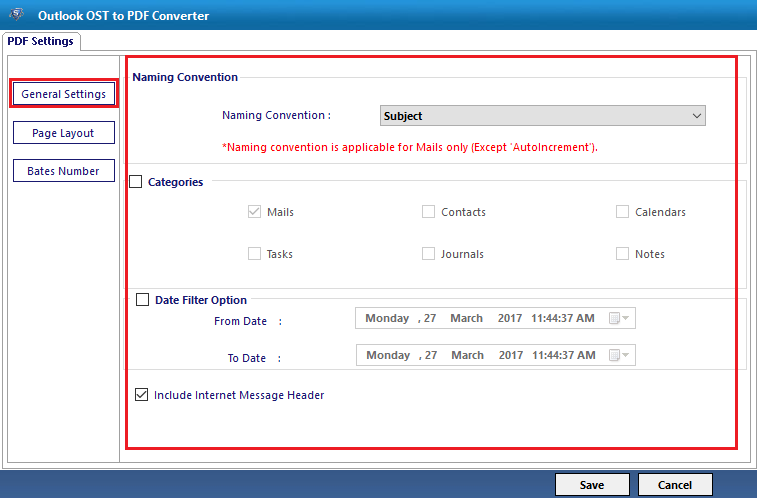 OST to PDF converter is a great and innovative software which saves multiple Outlook OST file emails in PDF file format locally. This application also exports orphaned OST files to PDF file without installing Microsoft Outlook in the PC. Quick scan and preview OST file items like emails, contacts, calendars etc. The OST to PDF Converter utility does not requires Microsoft Outlook to be installed on the users system while migrating Offline Storage files into Portable Document File format. offline OST file in batch. After the OST file has been loaded the software will perform the quick scanning of that particular OST file. Plus, it will also generate the quick and instant preview of all the items contained in that OST file. It is done by clicking on each folder and the application will automatically load all the items that are within that folder. 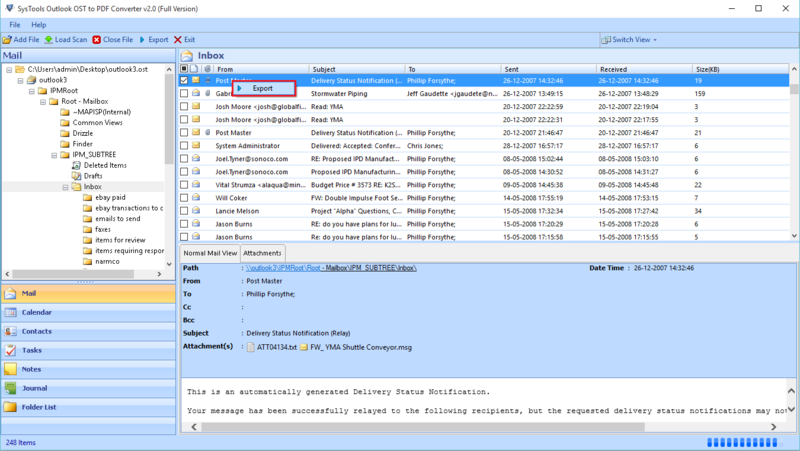 By using the Outlook OST Email to PDF migration utility the users are allowed to save the selected number of emails into the PDF file format. 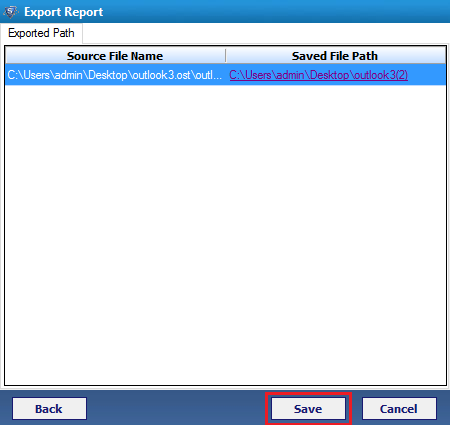 Users can check or uncheck the boxes and the export only the selected items into the Portable Document file format. Plus, the software maintains the original structure while it's saving the OST data to .pdf files. 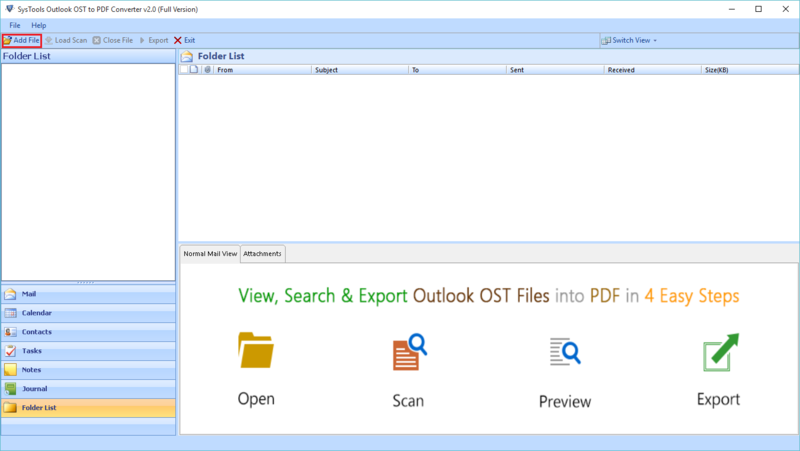 The Outlook OST files to PDF converter tool allows users to convert multiple Outlook OST file emails into PDF file format. The users can save all the emails from Inbox, Sent Mail, drafts and other email folders and then convert them to the PDF file format. The application loads all the OST file emails properties associated with it like From, To, Subject, Received, Time and size in KB easily in the preview. Also, if the user wants to sort the emails based on these attributes then they can do it by selecting the particular attribute and then order it in which they want to sort. Even though there is no Exchange Server connectivity but still the OST emails can be accessed as PDF file format. The software retains the integrity of the email data by showing all the appropriates like cc, bcc, from, to, send date and other email credentials of the emails stored in the PDF file format. 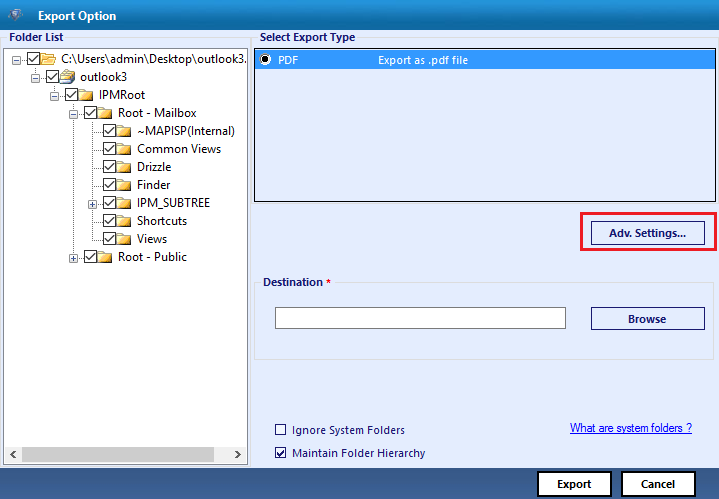 While saving all emails in OST to PDF file format, the users can select the desired location on their system. Plus, users can make the new folder directly from the software panel and then save the files directly in that folder. How to Convert Offline OST File to Portable Document Format? 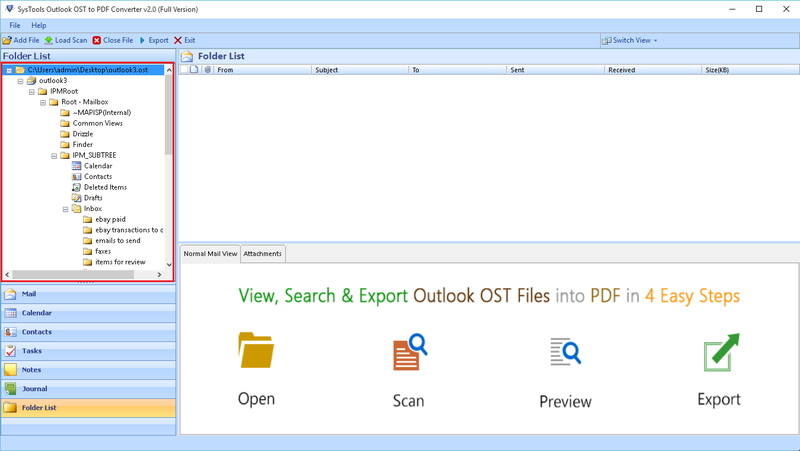 Step 1 : Download, install and run the software for converting Outlook OST emails into PDF formats on the system. Then click on the Add File option. Step 3 : Chose the OST files that are to be exported from the next window opened. And click Open button. 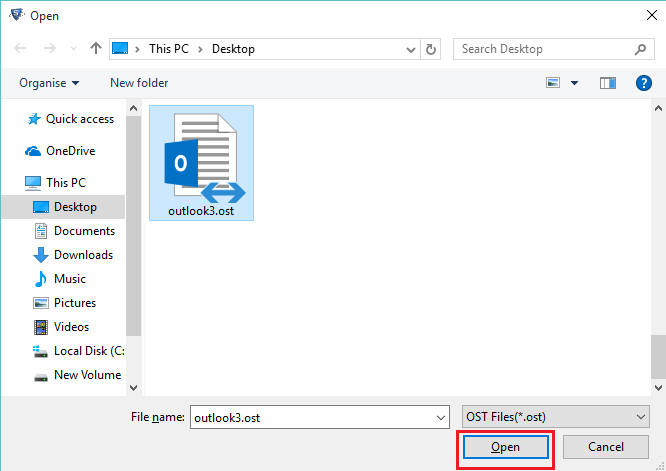 Step 5 : After the software has scanned the outlook OST file it will show the message of the confirmation of the successful scanning of OST file and then click Yes. Q. Can this application can migrate the email attachments in OST file? 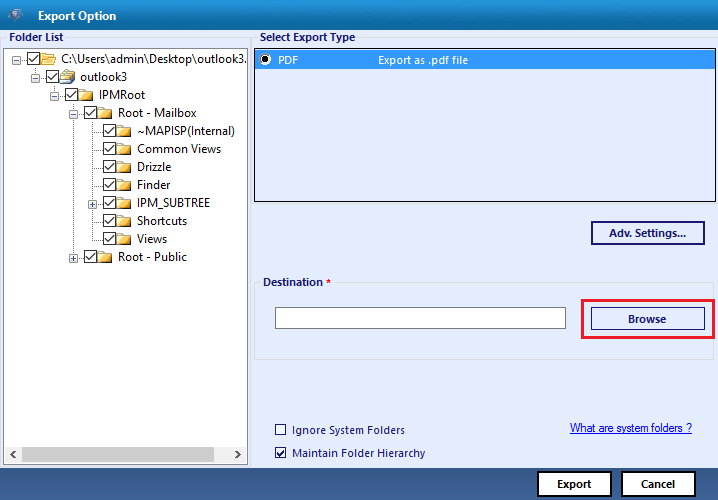 Ans: Yes, the Outlook OST email to PDF migration utility can move the emails along with its attachments into PDF format. All the attachments will be there in the PDF file with their respective file format. Q. Can this offline OST to PDF converter software export OST files in bulk? Ans: Yes, One of the main characteristics of this application is that, it does not imposes any file size limitation during the conversion process. 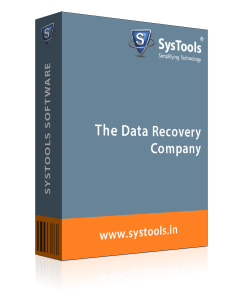 A user can migrate any number of OST files of any size into .pdf format without any issues easily. Q. Do I need to connect Outlook to Exchange at the time of conversion process? Ans: No, Microsoft Outlook need not be connected to the Exchange Server while the conversion process is being performed. The OST to PDF converter software does not requires Outlook installation in the client system. Note: OST to PDF Converter Software will get delivered on your registered email id, within few minutes after placing the order. I am the most satisfied customer after I used the Outlook OST to PDF migrator software for converting my Outlook OST files to PDF format. The speed at which it scanned and converted the outlook OST files emails was amazing and the accuracy of the process was also very good. I rate this software 10 out of 10. For a successful company, it is really great that they have created such an amazing product. But I wouldn't let this great opportunity slip by as OST to PDF conversion software is something which is considered very simple software but involves a lot of technique and technologies to built. Thanks to your tool, I was able to perform a technical thing without any complications involved.